It’s eighth-versus-first in the SPL’s televised Christmas Eve game, a team who have lost just one of their last 29 league games visiting one winless in four, however it won’t be as straight forward as Rangers’ odds of 4/9 suggest. The champions have been efficient but far from dominant in recent weeks, as despite winning eight of their last 11, four of those successes were achieved by a one-goal margin and none by more than two. St Mirren meanwhile claimed a point at Ibrox in the last clash between the clubs in October, though their failure to score let alone triumph at home to any of the four sides directly below the table-toppers helps explain their odds of 6/1. It is 5/2 that Rangers are victorious by a one-goal margin and there are several trends indicating that as the likely outcome, including the fact that they have won four of the last seven meetings between the pair in such a fashion. Additionally, Danny Lennon’s men have grown accustomed to narrowly missing out on priceless points this year, with seven of their last eight defeats as hosts being inflicted by the odd goal. Factor in St Mirren’s aforementioned problems scoring in front of their fans on the big occasions and there is reason to believe that the end result will be 1-0 to the Gers at 6/1. 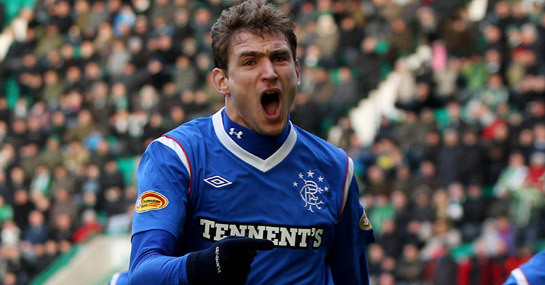 Nikica Jelavic is understandably the 7/2 favourite to break the deadlock having scored over half his goals on the road, while a scorecast on the Croatian firing first in a 1-0 win is 18/1.